Hugs and Happy Organizing posts are about client successes. 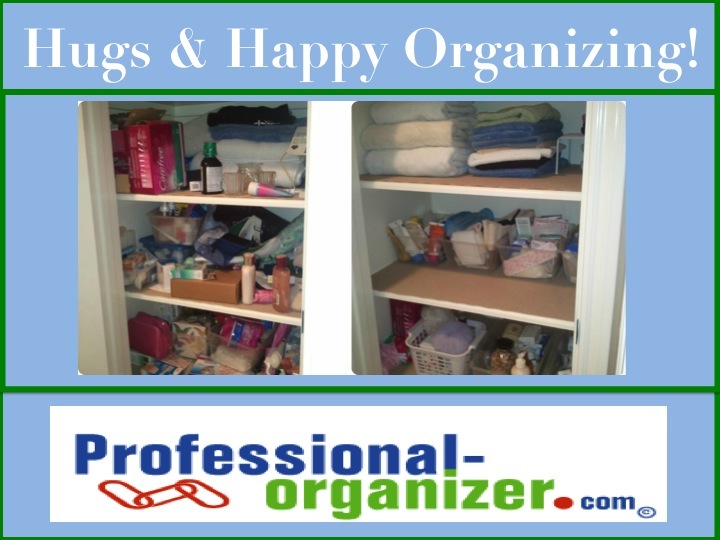 Here you will find a happy organizing story about a linen closet. Linen and medicine closets get out of control easily! Its a rush to get ready, find medicines, and just get access to stuff in these deep closets. Stuff gets stuffed in here! Happily we purged lots of items in the closet. We created groups of like items and confined them to plastic bins with labels. Its easy to access and easy to drop items back in. Labeling makes it easy to maintain order here. I love the concept of sharing our inside secrets as organizers. Throughout the month of May I have asked my colleagues to share what works for them. I know you will enjoy this guest post from Geralin Thomas, owner of Metropolitan Organizing. For me staying organized is an organic process. At different times in my life, different tools and techniques have been helpful. There have been several things that worked for awhile, but no longer work due to changes in my lifestyle. For example, before having children my filing system looked much different than it did after my sons were born. Now, as they finish high school and head off for college, again, my system has been revised and updated as I have increasing grown to use more technology and less paper. After all, even report cards are now electronic as are SAT and ACT test scores; that means fewer papers to file. One organizing gizmo that has been with me for at least a decade and used non-stop is my metal collator. It’s definitely one of my very favorite tools to use. I’ve used it to sort writing projects, family photos, homework assignments, tax papers, recipes, gardening ideas and almost anything else you can think of. When not in use, it collapses and sits in a drawer. And, best of all, to dust under hundreds of sheets of paper, I simply lift the collator up and relocate it. I don’t think I’ll ever be completely paper-free, nor do I want to be. So, for me the collator is one tool that helps keep me organized and I’ll continue using it on a daily basis. I love the concept of sharing our inside secrets as organizers. Throughout the month of May I have asked my colleagues to share what works for them. I know you will enjoy this guest post from Leslie McKee, owner of McKee Organizing Services. My colleague and close friend Ellen Delap asked I write a short blog piece on how I stay organized. I thought it was a great idea and it really made me think. When you do what I do for a living, you often hear “Your house must be perfect!” and I simply smile and say that it’s really not, but it works! I think that might be how I do it. My goal in organizing is to make room for FUN and to get things DONE. I keep things streamlined because it is just easier and helps my brain work. The motivation is to go do something else. My mind seeks order in everything I do and when things get complicated I lose energy. This forces me to keep things simple and deal with less. I notice when something seems like its just taking too much time and not giving me a big return on my efforts. That defines frustration for me and I do one of three things immediately. 1. I decide whether it is worth doing. I have an easy time letting myself off the hook when I feel stuck and don’t spend a lot of time torturing myself. I just keep moving. So, my tricks and tips aren’t about how to fold your socks or organize your files. For me, it’s more how to keep it simple and get on with it! How to let yourself be free of the burden of being perfect and not to make organizing become a job in itself. 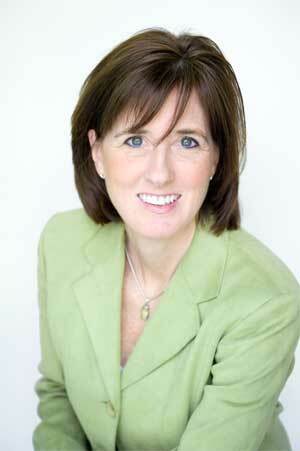 Certified Professional Organizer and Coach, Leslie McKee began her professional organizing career in 2000. 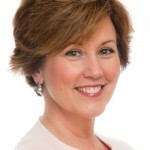 Her business www.mckeeos.com is comprised of hands-on organizing, personal assisting and coaching. Leslie inspires clients to live more simply and with purpose. In her coaching she specializes in helping people identify their strengths and work more efficiently to build a life that fits. Leslie has been featured in the New York Times, WSJ and on NPR, and she appears locally on Pittsburgh Today Live and KDKA Talk Radio. For more information contact Leslie at 412-341-8754 or via email at leslie@mckeeos.com. I love the concept of sharing our inside secrets as organizers. Throughout the month of May I have asked my colleagues to share what works for them. I know you will enjoy this post from Linda Samuels, founder of Oh, So Organized! Being organized enough helps me focus on what’s most meaningful instead of feeling stressed by systems and things. Here are 10 tips that keep this organizer, organized. 1 .“Buzz” Me – I can get completely absorbed with my morning digital communications (email, social media, blog.) To allow me to concentrate and also keep me on schedule, I set a timer to “buzz” me to stop and get ready to transition to next appointment or activity. 2. Hold Those Keys – I have an unreasonable fear of losing my car/house keys. I refuse to put them down until I place them in their designated “home” in my handbag. 3. Multiple Glasses – At 50+, my reading glasses are essential. Instead of playing the Moving and Hunting game, I’ve invested in multiple pairs. They are strategically located in the places I use them most like my night table, desk, purse, car, and organizing bag. While I’m not an advocate of excess, in this case, the extras are time savers. 4. Put Away Now – As new things enter our home, be it mail, groceries, gifts, or dry cleaning, I use the “Do it now!” mantra and put them away immediately rather than letting them collect in piles and corners. 5. “Buy Me” List – When we’re running low on items such as toilet paper, toothpaste, or milk, I add a reminder to the shopping list, which resides on our fridge. Family members also add to this list, so we help each other keep the essentials stocked. I grab the list on my way to the store. 6. Capture Ideas – To remember thoughts, to dos, or actions, I write them down. Pads of paper and working pens are always available. Just this week, I installed a waterproof pad (AcquaNotes) in my shower. I sometimes leave messages on my voicemail. The quick notes gets transferred to my electronic scheduling system, the “2Do” app, which I use mostly on my iPad. 7. Clear the Decks – Before bed and leaving in the morning, I take 5-10 minutes to return things back to square one. The bed gets made, the clothes go in the hamper, stray items are returned to their “homes.” I start and end my day with clear spaces, which allow for a clear mind. 8. Releasing Sessions – Twice a year, when making my seasonal clothing switch, I go through my drawers and closet to let go of the things that are taking up real estate, but that no longer fit or are wanted. 9. iLove – I’m a card-carrying member of the Apple fan club. I’m not sure how I’d stay organized without my 3 i’s- iPhone, iPad, and iMac. They sync with each other. They capture all my assorted lists, to dos, contacts, images, and schedule. They color code and remind me with dings and pop-ups. I know I functioned pre-“i”, but can’t remember how. My digital world, which meshes with my actual world, is organized in these three amazing devices. 10. “Not to Do” List – Before saying “yes,” to others or myself, I think carefully about the commitment. While I live a full, busy life, I try not to overschedule. This lets me fully enjoy what I have said “yes” to. If I’ve said “yes” to too many things and begin feeling overwhelmed, I look for what might be a candidate for the “Not to Do” list. 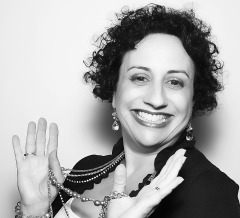 Linda Samuels, CPO-CD® is a compassionate, enthusiastic professional organizer and coach, founder of Oh, So Organized! (1993), author of The Other Side of Organized and blogger on organizing and life balance. She has been featured in The New York Times, Woman’s Day, Bottom Line Personal, Westchester Magazine, Everyday with Rachael Ray, and Enterpreneur.com. 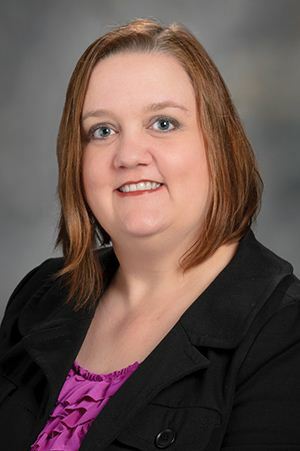 Connect with Linda on Twitter, Facebook, Pinterest, blog, or website. Sign up for a free monthly e-newsletter with bonus tips at ohsoorganized.com. I love the concept of sharing our inside secrets as organizers. Throughout the month of May I have asked my colleagues to share what works for them. I know you will enjoy this post from Janice Simon, in house organizer at M.D.Anderson. I work as an in-house organizer at a Houston area hospital, and I also have a home I’m trying to renovate. Here are a few of the ways I organize myself. Go digital whenever possible. I use Dropbox to house my documents and photos, Evernote to capture my ideas and things that catch my eye, Wunderlist keeps my action list handy, and the calendar with my email lets me know where I’m supposed to be. At work, I use a scanner to create PDF’s of anything that didn’t come to me electronically, and I’m starting the same process at home. Write Stuff Down (WSD). I stumbled across this concept from a couple of bloggers, and it’s brilliant. I don’t keep things in my head, and I will readily admit that my head is not the best organizing tool. I write down everything I need to do or to buy on my calendar or action list. It doesn’t stay in my head, swirling around to wake me up at 3 a.m. I have to be in love. If I don’t love something any longer or don’t use it, I donate it or give it to a friend who admired it. If something brings up bad feelings and bad mojo, it goes away. Establish boundaries. I’ve learned to say no over the years, and I’ve set strong boundaries. When I go on vacation, I don’t look at work email. It can wait. Take time off. And speaking of vacations, I take them. Since I work for a company, I practice what I preach to my colleagues. I don’t lose vacation time at the end of the fiscal year because I didn’t take enough time off. Remember birthdays. Because I have 14 nieces, nephews, godchildren and other small fries who call me Auntie Janice, I keep all of their birthdays on my digital calendar. Since all but two live outside of Houston, I set the reminder to remind me a week ahead. Everything in the closet must fit. If clothing doesn’t fit or I don’t like it or wear it, it goes. I only keep the items that I actually wear. I have a box in my closet where donated items go. Anything that is stained, torn, faded or otherwise unwearable goes in the trash. Charities spend millions of dollars sorting out trashed items in their donations, and I don’t want to be part of the problem. Repurpose, reuse or recycle. I recycle all that I can recycle. If something can repurposed or reused in another manner, I’ll do that. It may take a little imagination, spray paint and creativity, but it’s nice to save money when you can reuse something. The New Year Purge. The end of December is a great time to go through things at home to clear out anything I no longer love. I also go through digital and paper documents as well. At work, I clean out things at the end of the fiscal year and again at the end of the calendar year. Pay bills online or automatically. All of my bills are either automatically withdrawn or paid online by going to their individual websites. I don’t go through my bank itself to do their bill pay, and this is because I don’t want to do it through them. Not that I’m bitter after the way they treated most of us during the recession. At least not much. (BONUS TIP!) Reward yourself! When I make progress on a project, I reward myself with little things, such as dark chocolate or a pedicure. It’s important to remind yourself to take care of yourself and get plenty of rest. 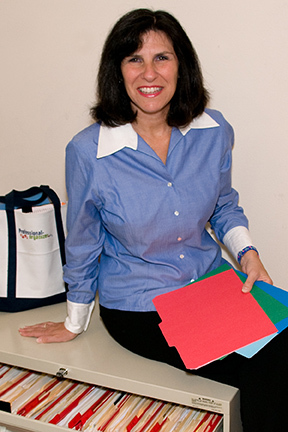 Janice Marie Simon, MA, CPO, is an in-house professional organizer at a Houston hospital and is The Clutter Princess at www.theclutterprincess.com. I love to keep things simple. I am a born organized person who wants to help others simplify, create order and help people live the life they imagined. So I wanted to share some tips that I use to make each day a little more organized. I love my planner! It helps me keep the big picture of my activities in a place where I can see them. I am always going to be a paper type planner person, but I do back up recurring events on a technology calendar. As soon as I commit to a date, I add it immediately to my planner. I break tasks into small, baby steps to make sure I can accomplish them and add this to my planner too. I add partners or delegate when I need help on a task. I work best on a team and my team members usually possess strengths I don’t have. I keep my perfectionism under control. I weigh the “Return On Investment” on whether to keep plugging at a task or know when it is done. My closet is organized by color and I keep a bag to drop donations in regularly. Some people find it more useful to organize by type of clothing, such as work, play, or party. Lists rock! I use them for every day tasks, shopping, and reminders. I sync my iphone and outlook to keep both my personal and business contacts together. Having all my connections together and easily accessible makes it easy to stay connected. Its easy to do this with any email program. My favorite apps are Reminders and Notes. I set alarms in Reminders and keep lists in Notes. These apps are free on any smartphone. I am a woman of great consistency. I love having the same bedtime, adhering to my weekly planning and admin time, and knowing that these routines serve me well. I keep in touch with my priorities. We can have it all, but not all at the same time. We have seasons in our life and I am enjoying my current season of working as a professional organizer and productivity consultant.